Neolev magnetic levitation dampers are our latest development. Placed under near-field monitors, home stereo speakers, turntables etcetera, they eliminate acoustic feedback and mechanical distortion and bring out the full potential of your gear. The stereo image is improved and bass frequencies are much tighter. Cancellation of contact induced resonance is very effective as forces perpendicular to the device are stopped from being transferred. Based on two repelling Neodium magnets one single NeoLev lifts up to 8kg. NeoLev's are adjustable to ensure perfect levelling. this is to give feedback about my experience with the 4 NeoLevs mounted under my 30 years old Linn LP12. This was the best value I’ve ever could add to my turntable! It’s very nice to have an adjustment possibilty on board of the NeoLevs, as especially but not only with turntables were the platter and the motor (if not externally mounted) is of a certain weight, and in nearly most of the cases out of the geometrical center of the turntable. Better bass, more dynamic, and better transparency with complex music load (tutti passages of orchestral music), it only now reveals it’s best performance. Thank you guys for making this happen! "What are the suitable applications for the Neolev?" 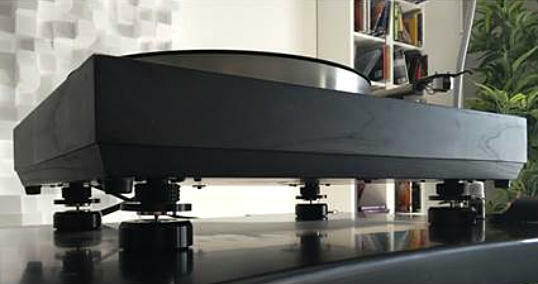 Neolevs are suitable for near-field monitors,HiFi speakers,Turntables,CD/DVD/Blu-Ray players,Preamps and Power amps. Yes NeoLev's are adjustable to ensure perfect levelling. "How much weight can one single Neolev lift?"